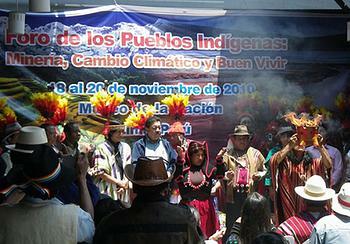 LIMA, Peru, November 26, 2010 (ENS) – Indigenous Peoples from across Latin America have issued a unified declaration demanding an end to large-scale surface mining by transnational companies on indigenous peoples’ lands. “We state emphatically: no to mining, yes to life,” they declared. The Lima Declaration calls for governments to revoke mining titles and concessions granted without proper consultation of Indigenous Peoples. “This is a significant step forward in the process of building proposals from Indigenous Peoples and social movements against mining impacts, extraction by transnational companies, and the climate crisis,” said indigenous leader Miguel Palacin Quispe, general coordinator of the Andean Coordinating Committee of Indigenous Organizations. Indigenous representatives from the Andes, the Amazon, and Central America drafted the Lima Declaration at the three-day Forum on Mining, Climate Change and Well-being at the Museum of the Nation from November 18 through 20. It was attended by 376 indigenous and allied participants from 17 countries. “Our territories full of life and harmony have been converted into territories of contamination and toxicity, territories of militarization and criminalization of struggles, territories of plunder and poverty because of pro-extractive policies guided by governments,” the declaration states. The declaration demands the approval of laws to determine zones prohibited for mining in indigenous territories, as the peoples of Costa Rica have achieved. 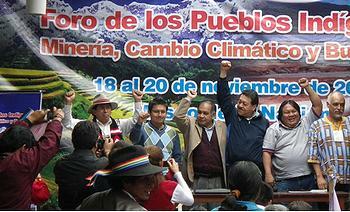 But in countries such as Peru, governments have criminalized and repressed protests against mining. As the indigenous representatives issued the Lima Declaration, tensions intensified in Peru’s southern province of Islay, where community members sought to block roads in protest of the Southern Copper Corporation’s Tia Maria mine project, which they fear will impact water quality and agriculture. About 10 protesters were injured by police using batons and tear gas at those protests earlier in the week. But Thursday, talks between government officials and community members achieved a 10-day truce. Work at Tia Maria has been suspended since April when, following earlier protests, the government set up a technical roundtable to discuss the project. But discussions have been boycotted by community leaders. On Thursday, the Peruvian Ministry of Energy and Mines once again invited representatives of indigenous organizations to discuss the Draft Regulations for Consultation with Indigenous Peoples for the mining and energy activities, published October 25 in compliance with a Constitutional Court order. The Lima Declaration makes clear the extent of Indigenous Peoples’ suffering as industrialization overtakes their formerly harmonious way of life. “The exponentially growing Western consumption, the looting of our natural goods and the industrialization of the developed countries have generated a global climate crisis to which is joined a food crisis. The effects of global warming have increased the risks of vulnerability of our rights and are modifying our way of life that for millennia has depended on Mother Earth,” the document states. Palacin Quispe said this inequality shows itself in international negotiations, in which the rich countries, responsible for 75 percent of greenhouse gas emissions, impose their conditions on poor countries in the international climate change negotiations. The Lima Declaration calls for establishment of a “continental platform of struggle in the face of extractive policies” and calls for another forum in the near future within the setting of the Fifth Summit of the Indigenous Peoples and Nations of the Abya Ayala, in Bolivia in 2011.